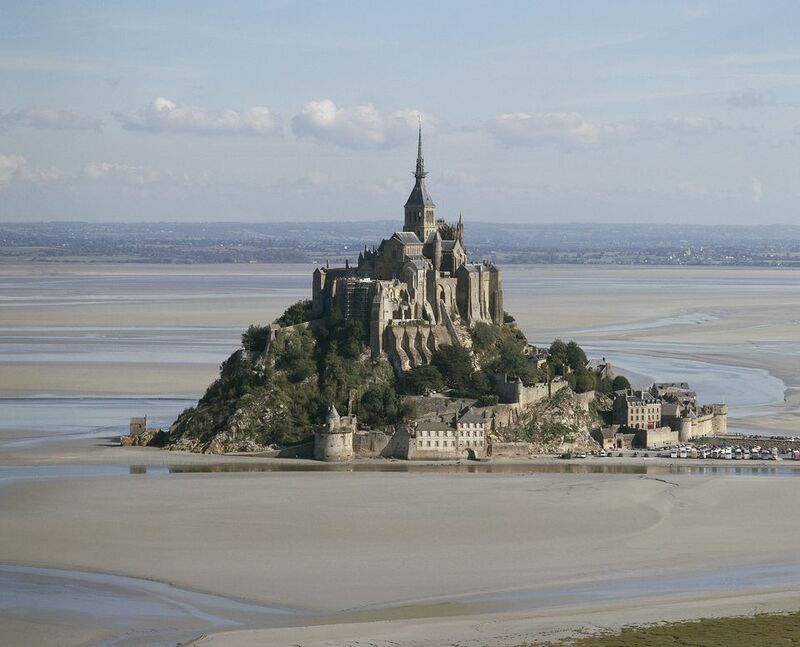 The most famous landmark in France outside the great icons of Paris, Mont St Michel is superb. The Abbey dates back to the 8th century when, the legend goes, the archangel Michael appeared to Aubert, Bishop of Avranches, prompting him to found a monastery. He built it on the rocky island that stands just off the coast of Normandy and Brittany, accessible in the past only by boat through the often stormy sea. The vast and imposing complex you see today was built from the 11th century onwards, with the most remarkable buildings dating from the 13th century. It’s an architectural feat in itself; the granite blocks were brought from the nearby Chausey Islands and from Brittany; the construction was on the ground that was steep and uneven. From the island there rose a wonderful collection of buildings, with the Abbey church at its center, its spire reaching high into the sky. The group of monastic buildings to the north of the mount is the most remarkable, La Merveille, or The Marvel. Today access is by a bridge opened in 2014. It makes the site once again an island, at its most dramatic when the sea pounds against the rock. Mont St-Michel has been a UNESCO World Heritage Site since 1999. If you want to stay nearby, check out the pretty village of Avranches. Jumièges Abbey in Normandy is one of France's most romantic ruins. Just 23 km (14.5 miles) west of Rouen in the small village of Jumièges, it is never overrun with visitors. Originally one of the great Benedictine abbeys in France, it was founded in 654 and rapidly, like all the great French Abbeys, accumulated great wealth very fast. It was rebuilt in the 11th century and continued as one of the leading institutions particularly known for its illuminated manuscripts produced in the Scriptorium. There’s a small leaflet you can pick up at the entrance to guide you through the ruins. The west front to the Eglise Notre-Dame is striking, with two towers that were built 46 meters (151 feet) high. But it’s best to wander at will, looking at the massive walls, gaping arches, and columns that are now home to countless birds. Jumièges Abbey also makes a good day trip from the chic seaside resort of Deauville which has good hotels. The wonderful Romanesque complex of the Abbaye de Fontevraud is not just an architectural gem; it's also intimately bound up with English history. Here are the tombs of the Plantagenet royal family: Henry II, his wife Eleanor of Aquitaine who died here in 1204, their son Richard the Lionheart, and the wife of his brother, King John. Another 11 Plantagenets are buried here. The Abbey, the largest in Europe, was founded in 1101 by the hermit Robert d’Arbrissel for both monks and nuns and was run for 700 years by a series of formidable women. Mostly royal born, they governed the monks’ priory as well as the communities of nuns and lay sisters. The buildings are immense, built to house both monks and nuns as well as the sick, prostitutes and a leper colony. The Abbey became a prison in 1804 and it continued as such until 1963. You see the church, the cloisters, chapterhouse with its 16th-century murals and the vast refectory with the restored Romanesque kitchen which needed 21 chimneys. The Abbey is now the important Centre Culturel de l'Ouest, western France’s cultural center and a hugely important piece of medieval archeology. It runs a wide range of activities; details are available from the Abbey or Tourist Office. It’s also very near the western Loire great châteaux, so makes a good extra attraction to take in. Good places to stay nearby include Tours, Angers, and Blois. Founded in 910, the Benedictine abbey of Cluny rapidly became the most powerful force in Christendom after the papacy. By the 11th century, there were 3,000 such Benedictine institutions, all feeding into the main Abbey. Cluny's abbey church, started in 1088 and completed in 1130, was understandably vast, boasting the highest arches built during the Romanesque era. Today the remains show just how great and glorious this institution was before its destruction during the French Revolution. Visitors to the Saône Valley’s greatest tourist attraction see the huge south transept with its two chapels and octagonal vault, the Chapelle de Bourbon with sculpted heads and the bell tower. Go into the Musée d’Art et d’Archaeologie in the 15th-century episcopal palace to rent out a small PC which shows you what the abbey looked like as you stand in certain places. Go up the Tour des Fromates (‘Cheese Tower)’ for a virtual reality screen that projects the former buildings onto a live cam showing the street below. Cluny makes a good stop on your way to Lyon or a good day out from that fabulous city. Fontenay is superb. You can walk around the abbey church, the cloisters, admire the irrigation and hydraulics of the water mill, see the dormitory, Chapterhouse, Monk’s room, kitchen and refectory as well as the forge, infirmary and medicinal gardens. Standing high up on a hilltop, you reach the Abbey of Vézelay, officially the Basilique Ste-Madeleine, through winding steep streets that lead up from the main square and the ramparts of this fortified village. The approach doesn’t prepare you for the site of the Abbey, once the gathering point for thousands of pilgrims on one of the great pilgrimage routes of northern Europe. Built between 1096 and 1104 and restored after a fire of 1120, the great Romanesque church is a masterpiece of simplicity and power. There are extraordinary sculptures over the central doorway where pilgrims gathered. Christ is in the middle; the apostles are around him, and below are the converted and the pagans – a motley mix of giants, pygmies, and dog-headed figures. Inside the glorious space stretches out before you. It’s breathtakingly impressive. If you’re lucky enough to visit at the summer solstice, you’ll see the sun coming through the south windows creating 9 pools of light leading to the altar. The Abbey of Sainte Foy in Conques in the Midi Pyrénées is huge, dominating the small, pretty village with its medieval houses and cobbled, steep streets. The Abbey was built between 1045 and 1060 so it's an unusually harmonious abbey church, with its great claim to fame throughout Europe being its priceless treasure. The treasure secured the fortunes of the abbey and the Benedictine monks grew rich on the proceeds from the pilgrims who passed through Conques on their way from Le Puy en Velay in the remote Auvergne to Santiago de Compostela on the trail of Le Puy. They came to pray to the relics and to gaze particularly at the Majesty of Sainte Foy, an incredibly rich gold and bejeweled figure which, it was believed, could cure blindness or secure the freedom of their relatives wherever they were held. Today Conques is a delightful place to visit, with good hotels and an excellent restaurant. The Benedictine Abbey church of St-Pierre in Moissac, consecrated in 1063 then enlarged later, was founded in the 7th century. In the 11th and 12th centuries it came under the Abbey of Cluny and in the 15th century was governed by abbots who built the gothic part of the abbey church. The French Revolution effectively destroyed the abbey and its monastic life; it became a gunpowder factory and billet for soldiers. The church and cloisters are now part of the UNESCO World Heritage Site of the Pilgrim Routes to Santiago de Compostela. What everybody comes to see are the cloisters and the porch of the church, which contain masterpieces of Romanesque sculpture. The tympanum, copied throughout the south of France, shows Christ in Majesty with the Book of Life in his hand. The abbey cloister has a garden at its center shaded by a cedar tree. The main draw here are the blocks of stone on the columns that support the roof, decorated with wonderful carvings depicting animals, plants, and scenes from the lives of the saints as well as the Bible. The Abbey is included in the excellent short trip programme on the Gascony Barge Cruise from European Waterways. November-March 10am-noon & 2-5pm; weekends and holidays from 2-5pm. Le Thoronet Abbey is the earliest of the monasteries known as the ‘three Cistercian sisters of Provence', along with Silvacane and Sénanque. The Abbey is set in deep Provencal countryside, hidden away from the world. An oak forest fills the valley so you get a very real sense of discovery when you come across the mellow stone buildings basking in the hot southern France sunshine. Built from 1160 onwards by Cistercian monks, it managed to escape the worst of the French Revolutionaries and remains intact. If you can, try to go to one of the concerts held here. It’s an inspirational experience to sit in the simple, beautiful lines of the Abbey and listen to the music. Finally to another of the Provencal Cistercian Abbeys, that of Notre-Dame de Sénanque which still functions as a monastery. Its setting, near the hilltop village of Gordes, is picture-perfect with its pale stone buildings set against a backdrop of fields of lavender. You can visit the abbey church, and walk through the cloisters as well as many of the rooms so vital to the life of the monastery. There’s also a good shop where you can stock up on Hypocras, honey, and lavender. You can take a guided tour which is unfortunately in French but still makes the best way to see the Abbey. Check the website for times.